Which months are samples taken? The summer report for the West Wales monitoring group is now available. 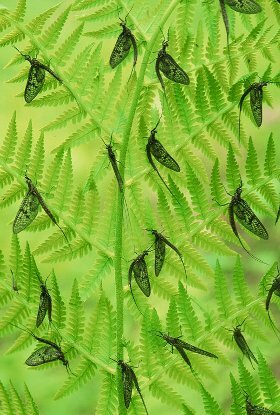 Problems persist on the lower reaches of the Afon Cych where it appears that there may be pesticide issues, a suspicion based on the absence of Gammarus - "shrimps" and Plecoptera, Stoneflies. This data has drawn the attention of the EA to the catchment and a detailed investigation into the water quality will begin shortly, we hope to be able to report on the findings in a few months time. 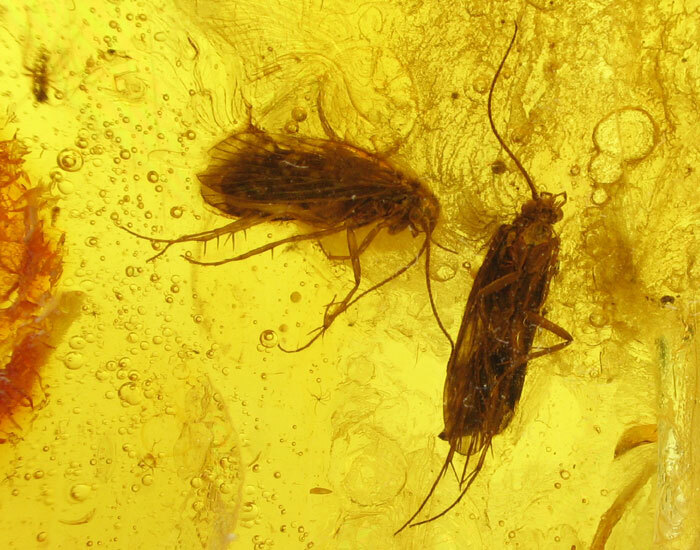 Caddis flies preserved in Baltic amber, over 30 million years old. Nicola Broadbridge has produced an excellent report detailing the results and actions prompted by the data which has been submitted to her by the three monitoring groups from West Wales. The document, in PDF form, makes interesting reading. I'm pleased to announce that we're now official partners of the Riverfly Partnership. The Riverfly Partnership is delighted to recognize the Teifi Rivers Invertebrate Monitors as an active member of the Partnership. The group and web link is listed on the Partners page of the RP web site The strong infrastructure of your monitoring is a great example of the AMI initiative. Partnership proves successful in reducing pollution Acknowledgement to all involved in the Rhymney River Flylife Monitoring Group, led by Dai Roberts, and the South East Wales Environment Agency Team for the monitoring and investigative work that has led to the successful EA prosecution of the company responsible for polluting the river Rhymney, as attached. This is the third successful EA prosecution resulting from the Riverfly Partnership Anglers Monitoring Initiative / Environment Agency collaboration in SE Wales. TRIM have received another four sampling kits from the Environment Agency Wales , thanks to Dave Charlesworth for his continuing support. Please submit your data to your coordinator by April 14th. If you can't manage to sample in the given month for whatever reason, family, social, weather etc. don't despair, get out as soon as you possibly can, we need that data! I'd prefer to receive data as a Word document via email but will happily accept scanned copies, hard copies or any other way of getting the data through. The sampling months are MARCH, JUNE, SEPTEMBER, DECEMBER. Those of you that couldn't find Blue Winged Olives this winter weren't mistaken. Through the winter months the eggs of the BWO remain intact but as the year progresses they'll begin to hatch and appear in our samples. There are more samplers being trained at the end of the month to help with our work on the Teifi catchment. If you know anyone who's keen to join TRIM please ask them to get in touch. A meeting for the new monitors and existing TRIM members will be held at the Porth Hotel Llandysul on Saturday 28th March at 6pm. Please come along to ask questions about the way the project's going and suggest ways in which it may be improved. Steffan Jones and Eric Davies have recorded some very large stone flies in their winter samples, some were 50mm long. All of the sampling points have been given new numbers. Please check which numbers your sites have been allocated and use it on the data monitoring sheets in the space provided - where it says "Site no. " It would be helpful to include the grid ref. too or describe the site location to avoid any confusion arising with regard to the location. The data's in for winter, many thanks to all of you that were able to get out despite the severe weather - the coldest for 13 years apparently. Please check whether your data has been recorded correctly .